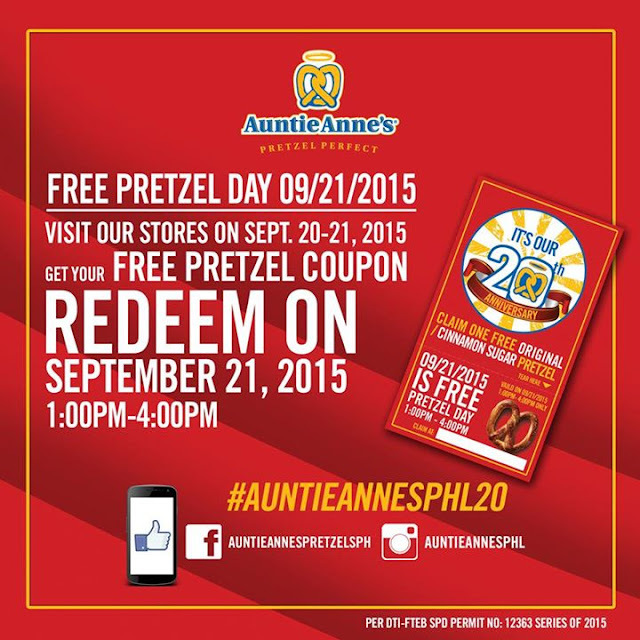 Adae To Remember: AUNTIE ANNE'S: FREE PRETZEL COUPON! Wow, just saw this on Facebook few minute ago! It's Auntie Anne's 20th anniversary! I'm a fan of Auntie Anne's, we will definitely go for this one. My daughter loves their pretzels and their lemonade. I will put this on my digital calendar to be reminded. It's just a night sleep to get the coupon and it's gonna be a FREE PRETZEL DAY the following day! First 300 Pretzel Fans can get a Free Pretzel on September 21, 2015 from 1:00 PM to 4:00 PM.